Researchers have created a new type of molecular motor made of DNA and demonstrated its potential by using it to transport a nanoparticle along the length of a carbon nanotube. The design was inspired by natural biological motors that have evolved to perform specific tasks critical to the function of cells, said Jong Hyun Choi, a Purdue University assistant professor of mechanical engineering. Biological motors are made of protein, which cannot be controlled, and they don’t function outside their natural environment. So researchers are trying to create synthetic motors based on DNA. The walking mechanism of these DNA motors is far slower than the mobility of natural motors, but DNA-based motors are more stable and might be switched on and off, Choi said. The new motor has a core and two arms made of DNA, one above and one below the core. As it moves along a carbon-nanotube track it continuously harvests energy from strands of RNA, molecules vital to a variety of roles in living cells and viruses. “Our motors extract chemical energy from RNA molecules decorated on the nanotubes and use that energy to fuel autonomous walking along the carbon nanotube track,” Choi said. The core is made of an enzyme that cleaves off part of a strand of RNA. After cleavage, the upper DNA arm moves forward, binding with the next strand of RNA, and then the rest of the DNA follows. The process repeats until reaching the end of the nanotube track. Researchers used the motor to move nanoparticles of cadmium disulfide along the length of a nanotube. The nanoparticle is about 4 nanometers in diameter. The motor took about 20 hours to reach the end of the nanotube, which was several microns long, but the process might be sped up by changing temperature and pH, a measure of acidity. In coming decades, such molecular motors might find uses in drug delivery, manufacturing and chemical processing. The new findings were detailed in a research paper published in the journal Nature Nanotechnology. The work has been supported by the U.S. Office of Naval Research. Intracellular protein motors have evolved to perform specific tasks critical to the function of cells such as intracellular trafficking and cell division. Kinesin and dynein motors, for example, transport cargos in living cells by walking along microtubules powered by adenosine triphosphate hydrolysis. These motors can make discrete 8 nm centre-of-mass steps and can travel over 1 micrometer by changing their conformations during the course of adenosine triphosphate binding, hydrolysis and product release. 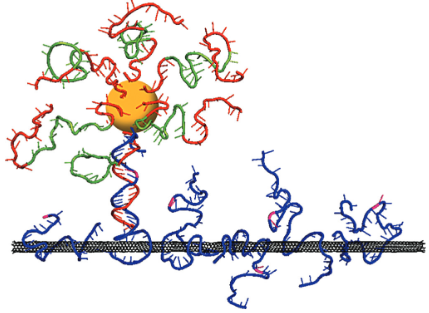 Inspired by such biological machines, synthetic analogues have been developed including self-assembled DNA walkers that can make stepwise movements on RNA/DNA substrates or can function as programmable assembly lines. Here, we show that motors based on RNA-cleaving DNA enzymes can transport nanoparticle cargoes (CdS nanocrystals in this case) along single-walled carbon nanotubes. Our motors extract chemical energy from RNA molecules decorated on the nanotubes and use that energy to fuel autonomous, processive walking through a series of conformational changes along the one-dimensional track. The walking is controllable and adapts to changes in the local environment, which allows us to remotely direct GO and STOP actions. The translocation of individual motors can be visualized in real time using the visible fluorescence of the cargo nanoparticle and the near-infrared emission of the carbon-nanotube track. We observed unidirectional movements of the molecular motors over 3 micrometers with a translocation velocity on the order of 1 nm per min under our experimental conditions.